If you want something hands-on to do this summer, look no further than the outside of your house. There are many reasons to refresh the paint job on your house, including increased protection against weathering, and increased curb appeal. Whatever your reason, read on to learn just what you’ll need, and need to do, to paint your home’s exterior. A DIY paint job is easily doable, and costs only as much as the materials, tools and protection you need. Those materials include the paint itself, the primer and the caulking (to seal cracks and joints). For tools, look for paintbrushes and rollers, sanders, and scrapers. You’ll also need drop cloths (to protect your lawn/garden), masks/respirators (to protect yourself), and a HEPA vacuum/suit if you’re stripping lead-based paint. Essentially, house-painting boils down to three steps. First, prep the surface. You’ll need to wash the house, scrape loose paint off and sand it smooth to make it an ideal surface to which the new paint can adhere. Note, if your house was built before 1978, test for lead-based paint (which will just require a little more protection while you’re scraping it off). Lead-testing kits can be purchased online. Next, patch and prime. Fill in smaller imperfections with something like epoxy. Bigger gaps and joints will need caulking but do this only after the primer is applied. Take this patching time to fix any rot or potential rot problems signaled by improper water drainage. Then prime the whole exterior this seals the wood and makes it even easier for paint to adhere to the walls. Finally, the paint. Water-based latex (or acrylic) paint is more flexible, easier to clean and more environmentally friendly than oil-based paints. Read the paint can they contain tips and instructions on using the paint that can come in handy. With DIY, brushes and rollers are better to use than a paint-sprayer, which can be hard to control. Three tips: always start at the top of the house and paint down, it’s always better to do two coats, and stay in the shade while you’re working painting in direct sunlight causes the paint to dry too fast and flake. 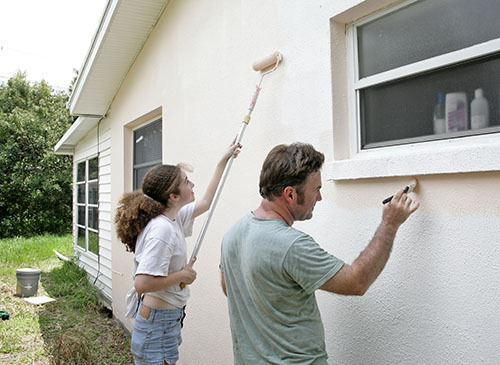 Once your exterior has dried, keep it looking fresh with consistent caulking, touch ups for peeling paint and removing mold and mildew whenever you spot it. For more tips or advice on improving your home’s value in your neighborhood, talk to your local real estate agent.